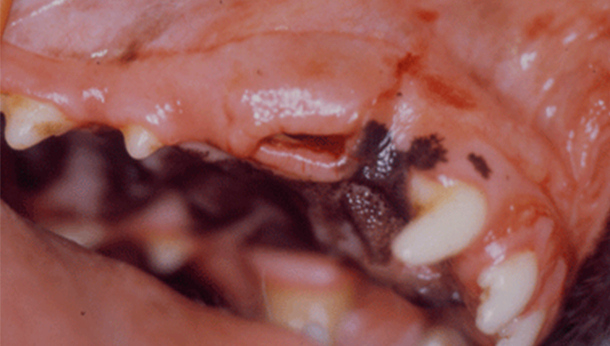 Avulsion of teeth – particularly upper canines – is a relatively common occurrence. The two most common reasons are catching Frisbees and fights among dogs. The forces produced by a flying Frisbee are considerable. Think about the centrifugal forces produced by a hard disc rotating at high speed. Teeth are often pushed sideways by these activities and, as the bone plate there is thin, can be relatively easily displaced - see below. Note the laceration in the gums at the front of the empty socket. On these occasions, the best advice to your client is to find the tooth as soon as possible, hold it by the crown - never the root - and gently rinse it clean of any debris with water, milk or saline. If possible, re-insert it into the socket it came from until they get to the practice. Alternately, store it in milk or saliva (or the mouth of the client!) until they reach the practice. Once there, the tooth needs to be inserted into the socket and splinted with figure of eight wire and composite or acrylic for around six weeks. The tooth below was excessively cleaned by the owner before they arrived at us. The root (lower 70%) should be covered with a nice pink ligament for successful implantation. Since the blood supply to the pulp has been lost irreversibly in an avulsed or subluxated tooth, successful fixation needs to be followed by root canal therapy a few weeks later. This is to prevent leakage of toxins from the pulp into the surrounding bone and also subsequent root resorption. Root canal treatments involve removal of all the pulp inside the tooth that no longer has a blood supply and replacing it with a mixture of gutta percha rubber and cement. This "mummifies" the tooth while still allowing it normal function. The radiograph below shows a root filled canine tooth solidly filled with gutta percha rubber and cement. See also this page. The four images below show a luxated lower right canine (top left image) on arrival after an accident in which the dog got caught in a fence. The top right image shows the composite resin splint covering the figure of eight wire between the two lower canine teeth and the lower left image shows the occlusion immediately post-op. The mouth can now close and the canine is in the correct position. The lower right image shows the tooth two weeks post-op when the root canal was performed. The above radiograph shows the root filled canine one year post-op. 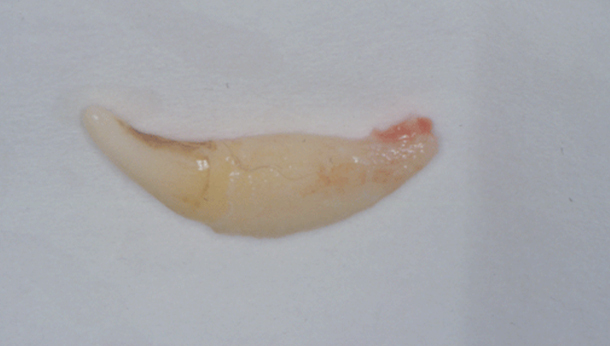 The root canal filling remains even, dense and uniform. The root dentine shows good density and there appears to be no immediate sign of root resorption or ankylosis. Long-term studies do show that these teeth that are re-implanted can continue to deteriorate within a few years - root resorption and/or ankylosis to the surrounding bone is the most common complication. Long-term prognosis needs to be guarded. 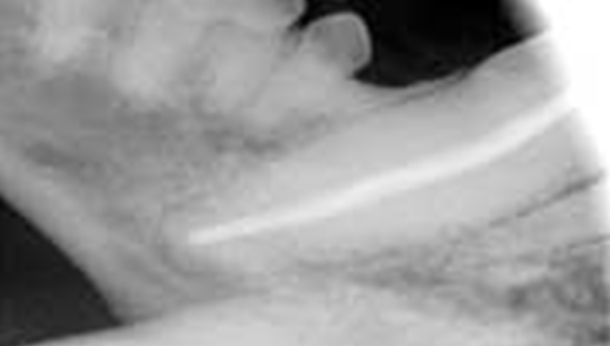 Problems such as external root resorption and ankylosis are common.